ALL TELEPHONE BIDS WILL AUTOMATICALLY START THE BIDDING AT $500. Mrs. Ruth Bryson was a widely distinguished antiques dealer and collector in Quarryville, Pennsylvania. Her expertise was unmistakable, noted by the exceptional personal collection of antiques she leaves behind following her death in July 2017. On Saturday, April 14th Pook & Pook Inc. has the privilege to exhibit and share her private collection with an auction of unparalleled quality, comprising just over 300 lots. Born in 1929 in Quarryville, Pennsylvania, Mrs. Bryson was the daughter of the late Ira and Okie Shumate. She was a 1952 graduate of Lebanon Valley College and two years later married Jack Bryson, a native of Ephrata, PA. The couple soon moved their growing family to New Jersey. Mrs. Bryson began her career in antiques setting up booths at antique shows in New Jersey and Pennsylvania. It was something she wanted to do, always having had a love of antiques. Her husband, whom she described as a “very supportive driver and porter,” learned about the wide world of antiques alongside her and helped turn her passion into a business. Opening a shop of her own was always a goal she aspired to accomplish. In 1982, as Jack approached retirement, the family purchased a property in Quarryville on Route 222. “It was good living in New Jersey,” Mrs. Bryson once said, “but there’s something about Lancaster County that’s always a draw.” On weekends, the Bryson’s began restoring the farmhouse and the three-story 1840’s barn to fulfill Ruth’s dream. Ruth’s lifelong goal had been realized; the hard work had paid off it and was time to share her passion for collecting with her community. 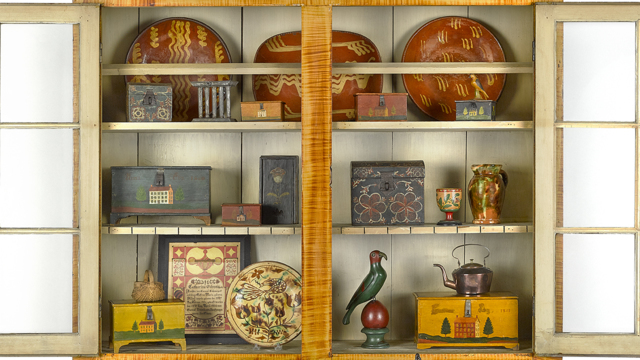 In 1986, Country Lane Antiques opened for business and the lovingly restored property became a haven for Ruth’s top-shelf collection of Pennsylvania German folk art. Covering two floors, the old farmhouse was stocked full of blanket chests, baskets, schranks, paintings, coverlets, corner cupboards, chairs, candleholders and high chests. Ruth believed that quality counted when it came to antiques and tended to favor the sturdy, large and colorful furnishings of Pennsylvania German craft, especially those made locally in Lancaster County. The items represented in Saturday morning’s sale embody the very best antiques Lancaster County has to offer, with lots encompassing every nook and cranny of Pennsylvania Dutch country culture including fraktur, samplers, folk portraits, weathervanes, and stoneware with a myriad of enchanting and unexpected examples in between. Beginning Mrs. Bryson’s sale on Saturday are objects representing the distinct and unmistakable elements of Pennsylvania German aesthetic traditions: bright colors, skillful hand carving, and natural imagery. The very first item of the sale is a fantastic carved and painted parrot attributed to “Schtockschnitzler” Simmons ($8000-12000), the self-taught cane carver of Berks County. Next, bidders will be scrambling to get their hands on their own piece of Lancaster County artistry with items from Ms. Bryson’s collection of carved and painted wooden boxes. The expertly curated collection includes three examples attributed to the Compass Artist including one diminutive example measuring just 6 ½” high ($12000-18000). 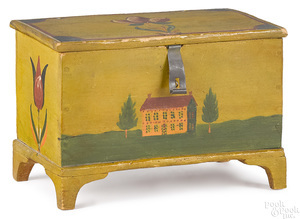 Other iconic Pennsylvania folk artists represented in this sale include nine boxes by Jacob or Jonas Weber, including one inscribed Anna Eby 1850, painted with a homestead landscape with flowers ($12000-18000). The collection of exceptional boxes is rounded out with a Drissel slide lid box with a German poem inscribed atop the lid ($12000-18000). Further evidence of Mrs. Bryson’s expert eye for Pennsylvania Dutch heirlooms include six lots of watercolor folk portraits and landscapes by German-born, Lancaster-based artist Jacob Maentel ($8000-12000). Examples of fraktur are interspersed throughout the sale, including a printed and hand colored birth certificate, ca. 1797, by Georg Friedrich Speyer ($2000-4000) and two examples by Samuel Bentz, “The Mount Pleasant Artist”, ca. 1790 and 1834 ($2000-4000). 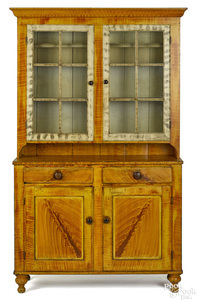 Noteworthy furniture sure to incite competition amongst bidders includes a painted pine and poplar two-part Dutch cupboard, retaining its original vibrant faux tiger and crotch grain decoration with smoke decorated doors ($10000-15000) and a Chippendale walnut dressing table ca. 1770 ($8000-12000). Several appealing examples of early 19th century miniature furniture are present in Mrs. Bryson’s collection, including a charming red and yellow decorated dower chest ca. 1800 ($5000-10000), a miniature walnut blanket chest ca. 1805 ($1500-2500), and a diminutive pine dower chest with a sponge decorated surface and turned feet ($4000-7000). Two clocks produced by Lancaster County artists are on offer, including a walnut tall case clock, ca. 1780, by Revolutionary war soldier Jacob Gorgas ($3000-5000), and a walnut inlaid Federal tall case clock by John Hoff, ca. 1805 ($3000-5000). Examples of the highly desirable and uniquely Pennsylvania Dutch schrank, or kas, will also be on offer ($5000-10000), with five chances to own a distinctive piece of Pennsylvania history. Saturday’s sale winds down with an assortment of collectible items including a number of wrought iron household items, Thomas Danforth pewter plates ($300-500), several lots of baskets, and a room-sized Ferraghan carpet ($2000-4000). Interested bidders are encouraged to contact Pook & Pook, Inc. at info@pookandpook.com or (610) 269-4040 with questions regarding condition reports, online, in-house, phone or absentee bidder registration, or to purchase a printed catalog for the sale. Catalogs for all sales can be viewed online at www.pookandpook.com or www.bidsquare.com. Phone, absentee, live salesroom, and online bidding will be available. Online bidding will be through Bidsquare at www.bidsquare.com. Gallery exhibitions are scheduled for Saturday, April 7th from 9am-1pm, Wednesday, April 11th from 10am-4pm, Thursday, April 12th from 10am-4pm, and Friday, April 13th from 10am-7pm. A reception will be held on Friday, April 13th, from 5PM to 7PM (rsvp to info@pookandpook.com). On the morning of Saturday, April 14th, the exhibition will continue from 8AM to 10AM with the auction starting at 10AM.